Delos island is an archaeological sanctuary, listed by Unesco as one of mankind’s most important cultural and historical sites. Chased by the jealous goddess Hera, Leto wandered from place to place looking for some corner of the earth in which to give birth to her son, fruit of the union with Zeus. Every city and island refused to receive her and only a bare rock in the middle of the sea dared to refuse to obey. There she gave birth to Apollo and the island glowed like burnished gold and became Delos (the visible one). From the 17th century an increasing number of European travelers visited Delos, sketching its ruins and recording precious information. In 1873 the French Archaeological School at Athens began the excavations that continue to this day, uncovering a large sector of the once large and affluent city with sanctuaries, harbors, market places and residential quarters. A must for all visitors! A half-hour boat trip takes you to the famous historical Delos sanctuary, birthplace of Apollo and Artemis. 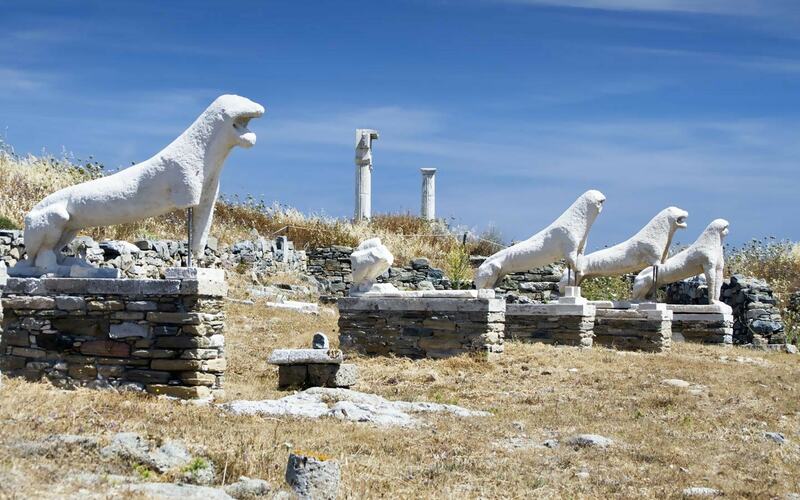 Your guide shows you the ancient temples, mosaic floor villas, the famous Delos “Lions”, the amphitheater and much more. Tour takes approx. 3 hours. Languages: “Monolingual” (one language) guided tours in English, French, German, Italian and Spanish (Russian upon request).